adorned with a black plum ) for her. See how taste n health can go together!!!! Diced seasonal fruits set in jelly, black plum . n garnish with a fresh whole plum. 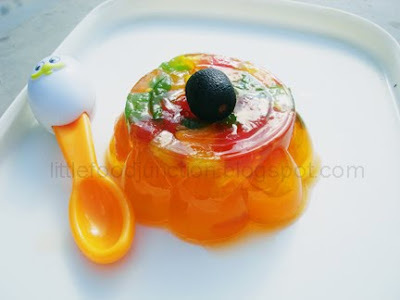 for example in this one its difficult to understand how u got that red, pink colors over the jelly?? Thanks for the advice dear. U r so right .... I 'l surely follow your advice n write about the recipes in detail.....also i'l try to include step by step pics of the featured edible art!!!! First of all I must say I missed your blog all these days.. Wow wow wow how wonderful you have done simply superb. Just loved everything, cannot say which is best everything was awesome. Will be here often.